I have to admit that I don't often make recipes from Rachael Ray's talk show. I know, I know, what kind of Rachael Ray fan am I? In my own defense, the recipes from her talk show aren't always 30 minute meals and I just prefer her simpler meals that are geared towards quick preparation (even if it isn't exactly 30 minutes). 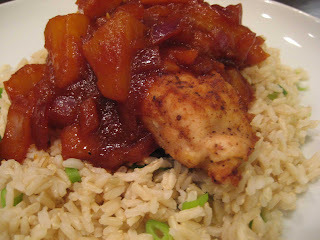 However, I made an exception when it came to Rachael's recipe for Hula Chicken with Pineapple BBQ Sauce. I made this recipe shortly after I came home from the hospital after having Darcy. I know, what kind of idiot cooks a couple weeks after giving birth? But, for me, life had changed so much that I really wanted some connection to what life was like before her arrival, and cooking provided the perfect means to do so. Plus, my Dad was visiting and could take care of Darcy while I was in the kitchen (and she used to sleep all the time too, which helped). Get the rice going, according to the package directions. With that working, flatten the chicken breasts into cutlets first by butterflying each piece. Open one of the breasts up and place it into a large zipper bag with a small amount of water [I just use a little dash of water and that seems to be enough]. Squeeze as much of the air as you can out of the bag then seal it. Using a meat mallet or small, cast iron skillet, pound the breast out until it's evenly thin (while you'll need a little force here, don't be too aggressive when pounding or you'll end up with an uneven cutlet or, even worse, tear the meat). Remove the cutlet from the bag and reserve it on a large cutting board. Pound out the rest of your chicken breasts the same way. With all of your chicken flattened out, take one cutlet and lay two pieces of sliced ham in the center. Top it with a small handful of cheese (about 1/4 cup) and roll it up into a log. Secure the roll-up with a toothpick then roll up your remaining chicken breasts, ham and cheese the same way. Season the outside of the roll-ups with salt and freshly ground black pepper and toss them lightly in the flour to coat the outside. While the chicken roll-ups are cooking, place a medium skillet over medium-high heat with 1 turn of the pan of EVOO, about 1 tablespoon. Add in the onion and pineapple, and cook until the onion begins to get tender, 4-5 minutes. Add in the brown sugar, vinegar, tamari and tomato sauce. Simmer your homemade BBQ sauce for a couple of minutes to thicken it up and season it with salt and freshly ground black pepper. To serve, stir the sliced scallions into the brown rice and put some on each plate. Slice the chicken roll-ups on an angle and pour the sauce over each one.